A mix of students of various backgrounds and nationalities spent six weeks in Lebanon acquiring language skills, absorbing a bit of Arab culture and exploring Lebanon, via LAU’s Summer Institute for Intensive Arabic Language and Culture. SINARC is a total-immersion program that caters to foreign students, working professionals, expatriate youth of Lebanese origin and even children of foreign nationals stationed in Beirut. Around 55 students enrolled in the program this year (June 27-August 5), mostly from the United States. The group included Europeans and students of Lebanese descent seeking to improve Arabic reading and writing skills, if not acquire them from scratch. “We have 15-year-old high school students as well as doctorate students and working professionals,” said Dr. Mimi Milki Jeha, the program’s director. Dr. Jeha said the turnout was a result of close contacts the program had maintained with American universities that offered degrees in Arabic studies. “Our website is doing a great job too,” added Jeha, as the majority of the applications were submitted online. “It is an amazing program,” said Natalie Bonomo, a half-Italian, half-Lebanese participant who lives in North Carolina. “We got so much support from everybody,” she added. Bonomo first attended SINARC last summer. It was also the first time she ever visited her mother’s homeland. The experience was so positive, she decided to return for more courses in 2005. Piotr Demski, who hails from Poland, enrolled in the program five years after graduating from Warsaw University with a degree in Arabic studies. “When I looked up the course on the internet, I thought it was the best way to practice and improve my Arabic,” he said. An employee at Polish Airlines, Demski enjoys vacationing and learning at the same time. He amazed everybody during a field trip to the Bsharri cedar forest in North Lebanon (photo below) when he started muttering verses from a poem by Mikhael Neaimy. 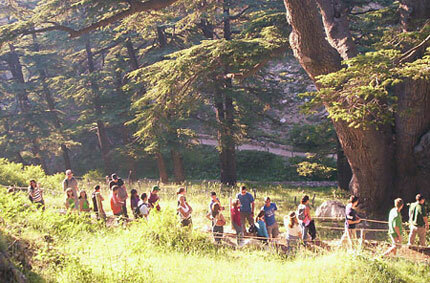 To him, walking between the cedars was evocative of Fairuz. Dennis Kumetat was continuing graduate studies at the American University of Beirut when he heard about the program at LAU. He enrolled hoping to improve his basic knowledge of Arabic in preparation of his master’s degree. Most of the American students took SINARC courses as part of major requirements at their home universities. The program was based on the Beirut Campus, but not confined to it. During a field trip to North Lebanon, all participants hiked to Qornet Al Sawda, the highest mountain peak in the country at more than 3,000 meters above sea level with a thrilling panoramic view of Lebanon. Other excursions took them to Byblos, Beiteddine, Anjar, Baalback, Douma, Sidon, Tyre and Syria. SINARC offers eight-credit, six-week courses covering the elementary, upper elementary, intermediate and advanced levels, in addition to the Lebanese dialect (two levels). A student enrolled in one course is expected to attend 20 hours per week of intensive classroom instruction, where Arabic is the only language used. The credits are transferable to students’ home institutions for evaluation. Weekly lectures on topics related to Arab and Lebanese politics, history, society and culture are also offered in addition to weekly field trips and cultural excursions to historic and tourist sites across the country.